I love the fact that occasionally Google lets something slip. And I love the fact that many an eagle-eared webmaster is there to hear it. This can, and often does, lead to some confusion in the SEO ranks however, so be careful with the knowledge young Padawan. This is an extract from TWIS SEO News & Updates w/e 15 Sep 2017. Make sure you read the summary, key actions and background info. At the Canadian Think Auto Google, the head of Google Brain Canada intimated that Google uses click data to update rankings. This has long been known, but rarely confirmed. Whatever way we think it works, it probably doesn’t work that way. Really this is about Google applying machine learning to the ways in which people use search results. Understand that Google is using click data in some way for SERPs. Realise that time of day, cohort, previous history and other factors may also affect SERP layout generally, and specifically. Don’t expect to be able to machine-click your way to No 1 in the rankings, it doesn’t work like that. Build pages and content around user intent and their position in the user journey, rather than optimising specifically for single keywords. Click here to contact me to discuss the ways you can merge keywords, topics and user intent to build a better content strategy. We’ve all known for some time that Google does something with the click data it traps on the way out of SERPs. Right? Generally, this helps Google to understand ways in which generic, or indistinct queries could be translated into better search results based more around what the user wants. Examples of this kind of user intent analysis in action usually revolve around changes in search queries like “pizza” between the morning (recipes) and meal times (ordering pizza). For a long time, it’s been reasoned that Google only works at a very large scale on this, as otherwise the SERPs are too easy to game. That is you could set 1000 bots to click your result all the way to number one – clearly that can not work. You can see this kind of thing in action with personalised results. 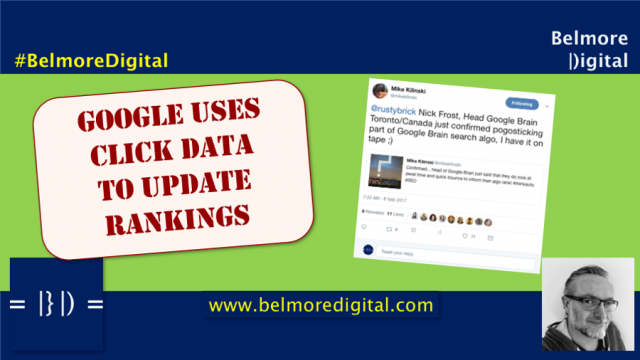 I have to confess, I find personalised results rarely adjust themselves, which is perhaps indicative of the lack of gameability when it comes to using click data to update rankings. Whoopsie. Google person lets it slip that they do use click throughs for ranking. Undoubtedly they use them in a different way to the way we imagine.